With their iridescent suits, gold chains and sideburns, the Butabi Brothers (Will Ferrell and Chris Kattan) are confident they're cool enough to go wherever the night takes them. But the doormen at L.A.'s hottest clubs think not, and keep them out on the street - until a fortunate accident ushers them into the ultra-hip Roxbury Club and into a life they once only dreamed about. $9.604 million on 1865 screens. Back before he became an “A”-list movie star with flicks like Talladega Nights and Blades of Glory, Will Ferrell was just another Saturday Night Live cast member who aspired to big screen glory. Like many of those folks, Ferrell’s first lead role in a movie came via an adaptation of an SNL character. 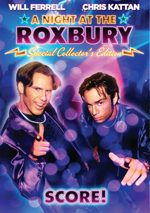 Along with Chris Kattan, Ferrell reprised the club-obsessed Butabi brothers for 1998’s A Night At the Roxbury. Here we meet Steve (Ferrell) and Doug (Kattan), a pair of sleazy dorks who want little more than to get into the Roxbury Club. Actually, Doug dreams that they’ll open their own club someday, but Steve doesn’t think they can reach that goal when they can’t even get into someplace like the Roxbury. They fail at this until actor Richard Grieco (himself) rear-ends them and acts as their pal mostly to avoid legal woes. Once he gets them into the Roxbury, their lives take a turn for the better – for a while, at least. The movie follows their ups and downs as they try to live out their dreams. Roxbury involves some talented folks, but you wouldn’t know from this almost wholly mediocre product. For these sketches expanded to films to succeed, they need to find something to offer beyond the same gags seen in the SNL bits. While Roxbury manages to provide a semblance of a real story, that doesn’t make it engaging. Really, that’s the biggest problem with the flick: it remains so completely ordinary and forgettable from start to finish. I don’t blame those behind it, as they really do try to create a full-fledged tale here. They even attempt character arcs as they expand the Butabi universe to include family, friends and others. None of it works. Ordinarily I criticize movies like this because they come across as a collection of skits connected only by a loose thread. In this case, however, we get too much story and not enough comedic inspiration. It feels like those involved tried so hard to make sure that Roxbury wouldn’t just be a conglomeration of comic bits that they forgot to bother with the humor. This doesn’t mean that Roxbury ends up as an unpleasant experience. No, I don’t find many laughs in it, but I also can’t claim that I minded the film. The performers are likable, and we also get to see pre-fame Eva Mendez, Jennifer Coolidge and Michael Clarke Duncan in small roles. I can’t commend much about Roxbury just because it’s so darned blah, unfortunately. The movie may not do anything wrong, but it also fails to do anything right. It plods along for its 81 minutes and never engages the viewer. A Night at the Roxbury appears in an aspect ratio of approximately 1.85:1 on this single-sided, double-layered DVD; the image has been enhanced for 16X9 televisions. The movie received a solid transfer here. Sharpness worked well. Only a smidgen of softness crept into a few shots, and not with any frequency. The majority of the flick looked well-defined and distinctive. No issues with jagged edges or shimmering occurred, and I noticed no edge enhancement. Source flaws also remained absent in this clean presentation. Colors were usually fine. I thought that they could be a bit less dynamic than expected, but the hues usually seemed reasonably well-developed. Blacks appeared pretty firm and deep, while shadows showed good clarity and smoothness. I felt pleased with the movie’s presentation. As for the Dolby Digital 5.1 soundtrack of Roxbury, it seemed fine but it didn’t excel because of a lack of ambition. Like most comedies, the movie featured a limited soundfield that strongly favored the forward channels. It showed nice stereo spread to the music as well as some general ambience from the sides. Panning was decent, and the surrounds usually kicked in basic reinforcement. A few scenes opened up better, though, especially in the clubs. However, as most of the movie stayed with limited imaging. In terms of extras, we find a collection of featurettes. Score! Reliving A Night at the Roxbury goes for 24 minutes, 16 seconds as it combines movie snippets, archival materials, and interviews. We hear from producers Amy Heckerling and Lorne Michaels, director John Fortenberry, writer Steve Koren, executive producer Robert K. Weiss, original owner of the Roxbury Chris Breed, and actors Will Ferrell, Chris Kattan, Chazz Palminteri, Colin Quinn, Gigi Rice, Elisa Donovan, Dan Hedaya, Loni Anderson, and Molly Shannon. We learn about the origins of the Butabi characters and their development on SNL, the script and the movie’s story, notes about the Roxbury and nightclub research, expanding the characters for a feature, the cast, sets and locations, and a few final thoughts about the flick. “Score” turns into a pretty satisfying program. It offers a good history of the Butabi characters and explores the expected issues in a clear, concise manner. The absence of new remarks from Kattan and Ferrell disappoints, though it doesn’t surprise. That factor doesn’t mar “Score”, though, as it remains a good little show. Next comes the nine-minute and 11-second Roxbury Rags: Costume and Fashion Guide. It includes notes from Fortenberry, Kattan, Ferrell, Shannon, and costume designer Mona May, As you’d figure based on the title, we learn about the various outfits worn in the movie. This provides a surprisingly in-depth look at the subjects related to that topic, and it proves quite interesting. Do That Dance! goes for five minutes, 17 seconds and features Weiss, Kattan and choreographer Mary Ann Kellogg, We get info about various dance sequences in the film. While not quite as much fun as “Rags”, “Dance” also gives us a good nuts and bolts look at its topic. That makes it useful and enjoyable. Finally, Making the List fills eight minutes, 54 seconds with remarks from Breed, event planner Keith Collins, club security Brian Fitzpatrick, They talk about running clubs and how to make them successful. It’s a good look at the ins and outs of the kinds of clubs featured in the film. A few ads start the disc. 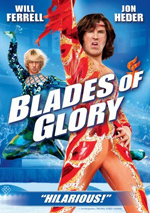 We get clips for Blades of Glory, Norbit, “The Will Ferrell Collection” and “The Eddie Murphy Collection”. These also appear in the Previews area. No trailer for Roxbury pops up on the disc. In terms of SNL sketches adapted into feature films, you could do worse than A Night At the Roxbury. However, you shouldn’t take that as an endorsement of the movie. It’s painless but utterly ordinary and forgettable. The DVD presents very good picture along with decent picture and audio. I like this pretty positive – and inexpensive – DVD, but the movie does little for me.